We are working to ensure everyone's vote truly counts in presidential elections. In two of the past five presidential elections, the candidate who won the most popular votes lost the election. And in every presidential election, candidates are forced to focus their attention on only a handful of swing states, essentially ignoring voters in every other state in the union. The winner-take-all Electoral College system that produces this anti-democratic outcome must be changed, so that voters in all 50 states have a say in choosing our president. Here’s how to do it: the Constitution allows states to decide how they award their electoral votes, so if enough require their electors to vote for the winner of the nationwide popular vote (instead of who won in that state), we could the problems with the Electoral College without needing to amend the Constitution. 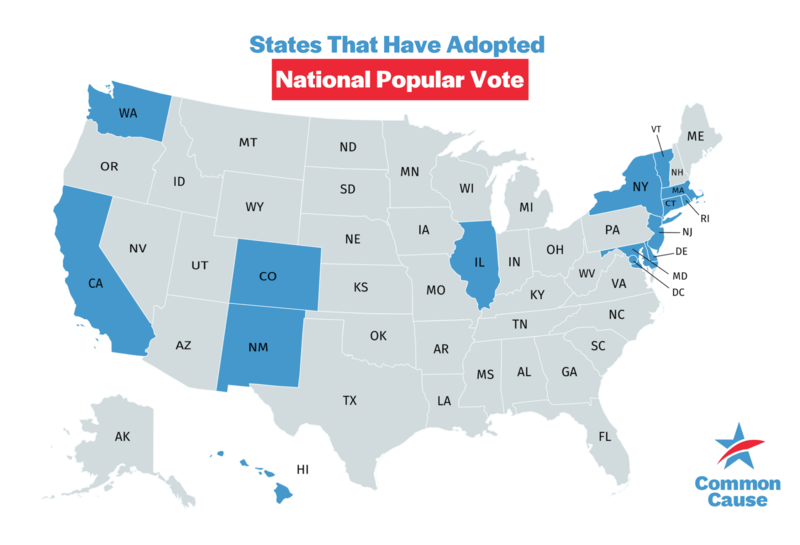 This National Popular Vote Compact wouldn’t take effect until states with 270 electors — a majority — joined in. But we’re closer to that than you might think — 11 states and the District of Columbia have already signed on, providing 189 electoral votes of the needed 270. Activating the National Popular Vote compact would reshape our democracy for the better. Not only would it ensure that the person who actually got more votes win the presidency, it would force candidates to spend time engaging with voters in all 50 states, instead of in just a handful swing states.